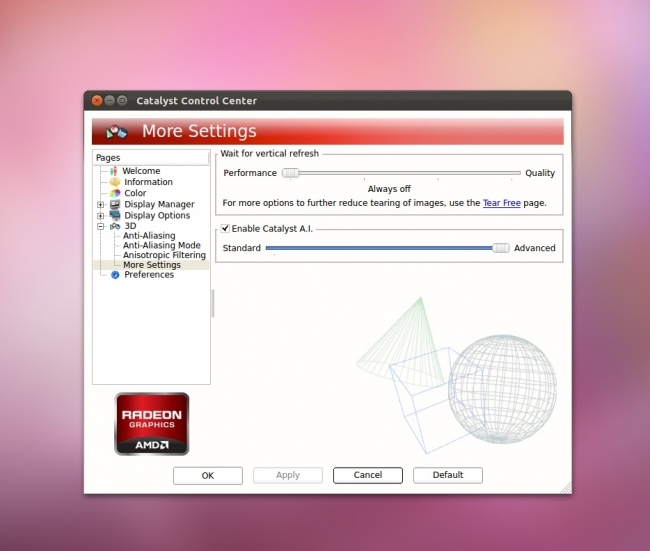 AMD Catalyst 13.2 beta 3 driver up to 300% performance ? After several posts into their forums, it is now the time for AMD to launch their most awaited driver (bug-fixes concerning to Steam Linux client) that comes in their 3rd instalment of Catalyst 13.2 beta. So, if you had problem with Serious Sam 3 or Team Fortress 2, now you can actually feel the ultimate gaming experience. Yet, there are many things remaining to be fixed, but this driver it was most awaited by many... many... people out there. Especially for us, Ubuntu users. According to AMD, there is a potential performance boost up to 300% improvement ONLY for Radeon HD 7000, 6000 series. However, I tested the game with my Radeon 6950 and I didn't notice a 300% boost. The overall experience is updated, indeed, but I can't see this 300% boost the AMD claims in their website. I will make some test with Radeon HD7000 as soon as possible and then come back. Good news don't stop here because there is another thing about this driver release. For the first time (if my memory serves me right) AMD offers you support for their upcoming GPUs: AMD Radeon 8000 series GPU also known as Oland family. According to TechPowerUp "the Radeon HD 8870, could offer performance comparable to today's high-end GPUs. The HD 8870 is clocked at 1050 MHz with 1100 MHz PowerTune Boost frequency; while the HD 8850 is clocked at 925 MHz with 975 MHz boost frequency. The memory of both SKUs is clocked at 6.00 GHz, yielding 192 GB/s memory bandwidth. The chips hence have 256-bit wide memory interfaces". AMD recommends you to run the installer and build the kernel automatically. Then reboot your PC and come back. In case you experience any tearing problems for Gnome 3 shell users, you are advised to enable the Tear Free option from the Catalyst Control Center. Too bad it was too little too late. I gave my 6870 to a friend, and got myself a GTX 680. The difference in drivers is significant. 6870 wouldn't stop tearing windows in Ubuntu 12.10 with the 12.11 beta 8 driver. To only support Xorg 1.13 officially after Ubuntu 12.10 has been out for nearly 6 months was too long a wait. Even my friends Nvidia 9300M GS performed better than my 6870 because of the driver difference. Games we tested were Guild Wars 2 (Wine) and Killing Floor. The frames per second were significantly different. For now, I am an Nvidia user. Would love to see some benchmarks of these 13.2 drivers though (e.g SS3, KF, GW2). I installed them. The perfomance is better...I get about 5-10 fps in trine 2 and tf2 is working great.....of course they have a long way to go but the are gonna get better one way or another(thank you Valve!!! ).My biggest problem still exists...TEARING!! !Youtube videos and video playback has tearing. I tried also with vaapi in vlc (installed xvba-va-driver) but still nothing. Tear-free still doesn't exist in control center. I guess that's because I have a mobility card (6770m/intel hd 3000). How can I send them an email or something to tell them my problem?